Peach cobbler made with fresh peaches, Southern Style! This peach cobbler for two recipe is Texas-style with a thin batter, you’ve got to try it! If you know me in real life, when I get excited, I have a huge smile on my face. Like, one of those smiles so big that I have to cover it with my hand. It’s a little bit embarrassing. I’m like a little kid on Christmas morning when good things are happening! I definitely have one of those smiles right now. 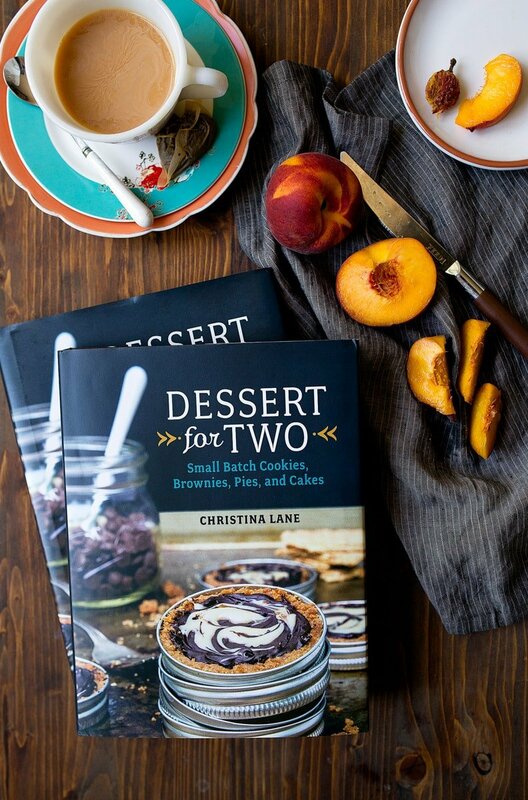 The exciting news is that the latest printing of Dessert for Two has a lay-flat book spine! What does that mean for you? It means that when you find something you want to bake (um, everything), you can lay it flat on the counter and it will stay open to that page. No more piling sugar containers on top of the book to force it to stay open on the page from which you’re trying to cook. Basically, it’s a baker’s dream. SO, in order to celebrate, I thought I’d share one of my favorite recipes from the book. This Easy Texas Peach Cobbler for Two. You guys know I’m a Texas gal, through and through. I may have lived in California so long that I lost my accent, and I may not eat as much meat as the average Texan, but the sheer number of peaches I eat in the summertime attests to my bloodline. 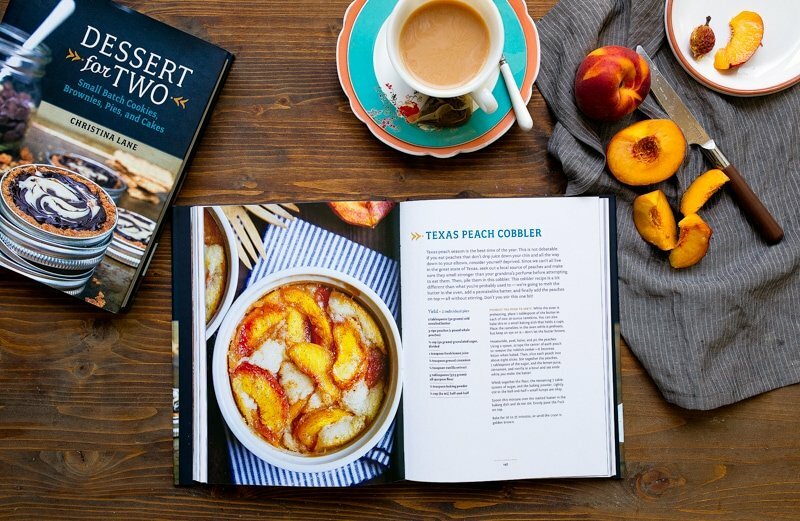 Texans make peach cobbler in a strange way (also known as the BEST WAY). Most people eat cobbler with biscuits on top, is that correct? I like biscuits; I would never complain about a cobbler with biscuits on top if you put it in front of me. But, you just have to try this unusual style of cobbler. It’s basically pancake batter baked around fruit. Batter that you’re not allowed to stir. Follow the directions–melt the butter in the ramekins, add the fruit, pour over the batter, and don’t stir. Deal? You’ll need two 10-ounce ramekins for this dessert for two. You could also use a mini baking dish, just make sure it holds at least 2 cups of liquid. Here’s the Amazon link again to the book (Dessert for Two cookbook), and since someone already asked, I’ll let you know that yes, any copy you order today will have the new spine. The last printing was completely sold out before this printing happened. Amazon has the latest printing. Anyway, enough about my cookbooks; this Texas Peach Cobbler for Two is where we should be focusing. I want to add, after some late-night emails and messages from readers, that the ramekins in the photos are not standard creme brulee ramekins. They’re slightly larger ramekins (like these), at 10 ounces each. I’m linking you to the clear Pyrex ones because they’re much easier to find (and cheaper!) than the white ones in the photo. I’ve been sent some photos of what this dessert looks like when it’s crammed into the standard-size small ramekins, and usually, the batter doesn’t cover the peaches and it’s not as good. So, if you don’t have the large ramekins, try to find a small baking dish, ok? Your taste buds will reward you! Awesome news!! Tonight, I used a bottle of rum to keep a cookbook open. So, yay! Also, that cobbler looks fab! Yea, that’s terrific! I am just wondering if I click on your Amazon link and order a copy today will I actually get one from the latest printing with the lay-flat spine? Thank you! Hi Joann, yes ma’am! Amazon has sold all of the copies without the lay-flat spine, so order away :) And thank you! Aww, Barbara, thank you so much! Your words mean so much to me :) I’m glad to hear you’re enjoying the book! You can take smaller (few pages) cookbooks (like those published by HP) to Kinko’s (now Fedex) stores and have them spiral bound. I’ve done that with several 8 1/2″ x 10″ books and they are so easy to use now. Is this like a clafoutis? Could this be it? Would a Texas cobbler have made its way to Wyoming do you think? I hope it has! I think maybe it is the same, or sillier! I am so ready to buy the book! Thank-you, thank-you, Thank-YOU, Sweetgirl! I cannot wait till August and Michigan peaches start coming on! Similar, not sillier, that was spellchecks idea…sorry. BEST. NEWS. EVER. Makes me want to bust out my copy and bake this peach cobbler right this minute! Good news! Congrats to you! 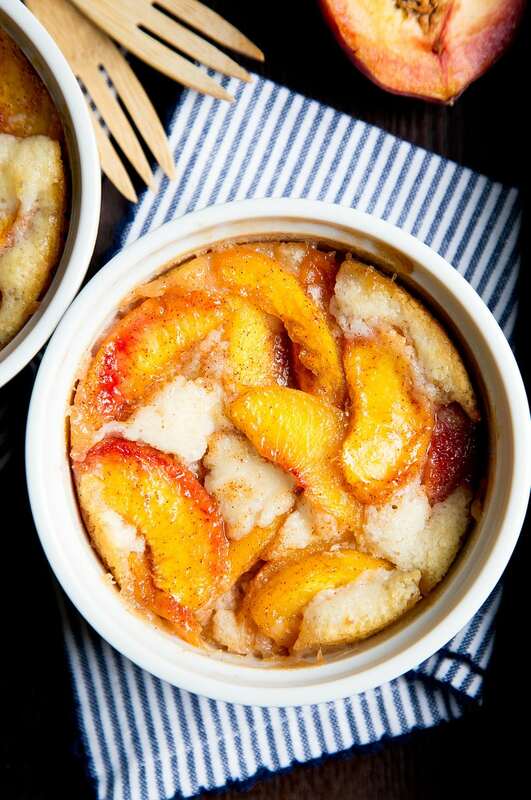 This peach cobbler looks sooo good! I must try it! Since moving to Florida, we have discovered Georgia peaches. They are baseball size and so juicy. I had five leftover peaches after making peach jam, so I doubled your cobbler recipe. 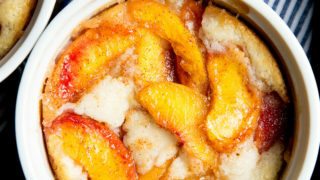 It was truly amazing – not too sweet – the tender cobbler showcased the peaches. Served it warm with vanilla bean ice cream. Thank you for this recipe…we’re headed to the Farmer’s Market today for more peaches. Good morning! Can I use canned peaches? I think so…drain them very well. Oops! Just read directions again to peel! The directions in the text and recipe are different. In the recipe, you say to top the butter evenly with batter and then top with fruit. But in the intro text, you say it should be butter, fruit, and batter on top. Can you clarify which is right? Thanks! Hi!! Can I use apples or pears instead of peaches?? Thanks!! I just put this in the oven. Growing up we always had the batter type cobbler. I actually prefer it that way :) Can’t wait to taste it. Hello. Do you have this recipe for larger quantities? I so want to make this tomorrow! Only ingredient I’m missing is half and half, can I use whole milk instead? It is absolutely delicious, dangerously easy to make but luckily (?) only makes enough for two servings. I made it two times with peaches and last night tried it with strawberries. Did the strawberries get very soft and juicy and sort of melt into the batter? Yes, they did. But it was so good that I will make it again tonight, served with whipped cream and maybe a drizzle of caramelized white chocolate 😊. I did adapt the recipe a little bit: I skipped the cinnamon and even skipped the vanilla in the strawberry version and instead of half and half I used whole milk. Thanks so much for this wonderful recipe, definitely a keeper! Think I could use frozen peaches instead of fresh?